Như đã hứa, hôm nay cô gửi tới em phần cuối cùng của chùm tổng hợp bài mẫu của 3 phần Speaking cho 20 Topics phổ biến nhất. Bật mí với các em: những bài mẫu trong 10 topics ở phần 2 còn được sử dụng nhiều trong các đề thi hơn phần 1 nữa đấy, do đó nếu đã ôn trọn phần 1 rồi thì sao lại không tiếp tục học tiếp phần 2 để “ẵm trọn” điểm thật cao cho phần Speaking nhỉ? 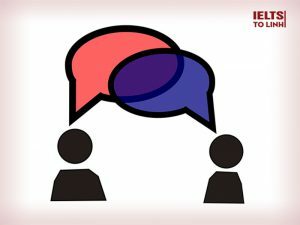 Học được bài chia sẻ này sẽ giúp không bị “tắt Idea” trong Speaking IELTS nữa đó, đừng bỏ qua nhé! Examiner: How would you describe yourself? Examiner: In which ways are you similar to your friends? Examiner: Are you similar or different to your brother(s)/sister(s)? Examiner: Which personal qualities do you think we most want to pass on to our children? Martin: I certainly would want my children to be self-confident and self-assured … I really believe that people who feel good about themselves are in a good position to face what life has to offer them … and I’d hope they wouldn’t be self-centred … but remembered to think about others. Examiner: Which characteristics do you think are the least appealing in a person? Examiner: Which personality types do you think are less likely to suffer from stress or anxiety? Examiner: Do you look like any other people in your family? Examiner: Tell me about your family. Examiner: What does your best friend look like? and say what it is about their appearance you like. Examiner: Is it important to dress well whenever we go out? Examiner: Do people worry too much about their appearance as they get older? Examiner: Is attractiveness a quality worthwhile aiming for? Examiner: What is it like where you live? Examiner: Do you like living in the city? Examiner: Do you get many tourists visiting your area? and say why visitors might enjoy going there. Examiner: What are the advantages of living in a city or big town? Examiner: In your experience are city centres usually attractive places? Mary: Some can be yes … especially those with a historical interest … but sometimes they’re full of ugly office blocks … multi-story car parks … and residents living in poor housing … it depends on the city doesn’t it? Examiner: What are some of the challenges facing towns and cities? Examiner: Should music be treated as seriously as subjects like maths or sciences at school? Examiner: Are there any environmental problems in your country? Examiner: Do you take an interest in nature? Examiner: Do you or your family take steps to help the environment? and say how you felt about this problem. Examiner: What do you think is the main danger the world faces in terms of the environment? Spencer: Well … climate change is a real issue … in my country we have flash floods and heat waves on a yearly basis … so yes … I think global warming is the biggest issue. Examiner: What examples are there of how we damage the natural world? Examiner: In which ways do we respond well to environmental problems? Examiner: Are there any TV channels in your country that don’t have adverts? Loraine: No … they’re all commercial channels and show adverts all day long … too many really … and there’s also a lot of product placement going on … especially in soap operas where they place an item just behind the actors. Examiner: Do you enjoy watching adverts on TV? Karin: No … not really … I hate commercial breaks during a film … it really spoils the flow … and during prime time viewing they seem to squeeze even more ads in than usual … celebrity endorsements also get on my nerves … everyone knows they’re only doing it because they’re getting paid. Examiner: What are the best ways for ordinary people to advertise something they want to sell in your country? Marianne: The simplest way is to place an advert in something like the classified ads section of a local paper … or there’s the Internet of course … there are lots of sites like eBay where you can buy and sell things online. and say why you thought it was so effective. Max: OK … well this was about 4 years ago … I was looking for some software to create videos … one day I got an email from a mailing list I’d signed up to … there was a link in it to a press release … a company had written something about a new product that was similar to what I was looking for … at the end of the press release there was a link to the sales page … I hadn’t heard of the company but I was interested and clicked the link to the ad …. what caught my attention immediately were the number of testimonials from people who had bought the software … I think testimonials are like the online equivalent of word of mouth advertising and are really persuasive … anyway … when I got to the bottom of the page there was a great big call to action button inviting me to buy … I was totally persuaded and ended up making a purchase … what made it so effective I think was the power of those testimonials … they’d been written by people very much like me … they’d had a need and the software had obviously turned out to be just what they were looking for … when you think that this was a newish company they wouldn’t have had any brand awareness at all … they probably wouldn’t have had much of a budget for advertising … obviously you wouldn’t advertise a product like this through the mass media on TV … they probably didn’t even have an advertising agency to support them …and yet they’d managed to create a great deal of brand loyalty from previous customers … I think that was really effective. Examiner: What is it that makes an advert effective? Spencer: Well … when a company launches a product they have to consider the Internet … especially how it can be used to spread the word on social media … so in this context a video that goes viral is probably the most effective type of advert you could make. Examiner: What are the advantages to companies of advertising on the Internet rather than TV? Stelios: I’d imagine the main advantage is you can reach your target audience much more effectively … if you bring out a niche product for example … or you have a tight advertising budget … you can advertise on particular sites that the people you want to reach visit … that’s not something you can do on TV. Examiner: What things do advertising companies do that might give it a bad name? Raol: For me the most irritating is cold calling … we must get two or three of these every day at work … then there’s junk mail that gets posted through the letterbox … and of course the online equivalent of this … spam emails … I think it’s this kind of advertising that tends to annoy people. Bài viết này không hề ngắn tí nào nhỉ, tuy nhiên đừng vội để độ dài của bài viết làm đầu óc các em quay cuồng nha, mỗi ngày chia ra học từ 1 đến 2 topic đều ổn cả, đừng dồn quá nhiều vào cùng một ngày nhé! Hãy thư giãn tinh thần sau khi học tập cật lực các bạn nhé! 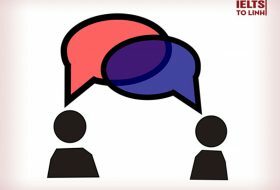 Ngoài ra, các em có thể truy cập vào thư viện Speaking for IELTS đã được cô Linh biên soạn nhằm tập trung cho các em nhiều thông tin bổ ích và chắc chắn sẽ bất ngờ khi khả năng Nói của mình cải thiện đáng kể đó!